“Codename White Mouse, Espadrilles” is a sculptural homage to the heroic life of Nancy Wake, a spy for Great Britain who was active in France during World War II. She was on the Nazi most-wanted list and they nicknamed her The White Mouse for her ability to elude capture. I first learned of Ms. Wake’s incredible career with her passing in 2011 at the age of 98. 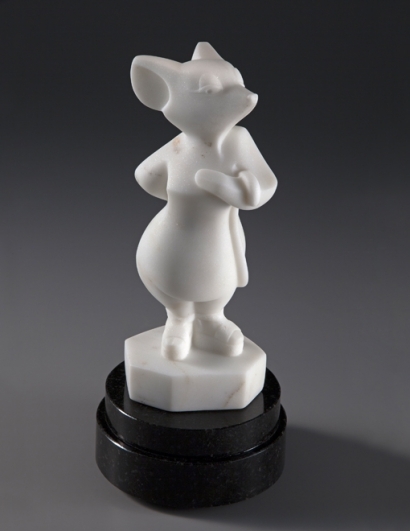 A representative from the Royal Star and Garter, a veteran’s organization in London where Ms. Wake lived, contacted me wanting to purchase a marble sculpture of a white mouse I had made. They wanted to purchase “She Who Stands and Waits” as a monument to Ms. Wake. The sculpture was already sold, but I offered to make them a specific stone sculpture to honor her. It turned out that shipping for the sculpture was very expensive, so I suggested they commission a monument from an English sculptor. However, this was not before I began researching the career of Nancy Wake. Her story blew me away. Nancy Wake was born in New Zealand, and moved to Australia with her family when she was a year old. Her father deserted the family and never returned, which greatly upset young Nancy. She inherited a substantial amount of money from an aunt and ran away from home in her mid-teens. Nancy Wake worked as a nurse, and trained herself as a journalist. She was reporting in Europe, particularly France, where she witnessed the Nazi persecution of Jews firsthand, which also greatly upset her. She met and married a wealthy, like-minded French businessman. Together they helped hundreds of people escape occupied France. This put her on the Nazi most-wanted list. She proudly adopted their nickname for her and always out-maneuvered them. Her autobiography is titled The White Mouse. The Nazis got very close to capturing her in 1943, but she escaped across the Pyrenees Mountains to Spain. She was wearing espadrilles at the time, a lightweight shoe popular in the 1940’s (and again in the 1970’s). This marked the first part of her heroic career for me, and I chose to present in marble Ms. Wake as the young, glamorous Resistance fighter in fashionable footwear. Feminine and fearless. Nancy Wake took a boat from Spain to England, where the English government invited her to join the Special Operations Executive, a secret service organization, to train as a spy. She excelled in all aspects of espionage training and parachuted from an airplane back into occupied France. She was most effective saving Allied lives and thwarting Nazis for the duration of the war. Nancy Wake was a glamorous, fearless young woman. She was an excellent shot, had unlimited determination, spoke her mind, and could drink any man under the table. Nancy felt her greatest achievement was a 190-mile, 72-hour bike ride to carry secret radio codes to Allied radio operators, and to send an urgent message to London. She had to pass through several Nazi checkpoints en route. She was a deadly flirt and greeted the Nazi soldiers with, “Hi boys, you wanna’ search me?” Her training in hand-to-hand combat proved life-saving on this journey when she had to dispatch a Nazi soldier with a karate chop to the throat. After the war, Nancy Wake learned that her husband had been captured, tortured, and killed by the Nazis in 1943 but he never disclosed any information about her. She was celebrated as a hero and awarded five medals by France including their highest honor, the Legion d’Honneur, and medals from Great Britain and the US. She accepted medals from other countries awarded to her later in life. The stone is Carrara Marble, the stone of gods and heroes. The vein and subtle inclusions in the stone remind me that Ms. Wake was not afraid to get her hands dirty, her spirit and bravery transcended her own comfort. The crystal in the stone dazzles, as does the adventurous life of Nancy Wake. Working small is quite challenging since most stone tools are designed for larger sculptures. I used tiny burrs and files for most of the work. The sanding and finishing process was ultra-painstaking since all the forms are very small. Perfecting them was a matter of microns. Working very small in stone is equally as challenging as working very big. Stone sculpture is a challenging medium for artistic expression. I must be completely committed to an idea and a design before moving forward to make the sculpture. One of the supreme benefits of being an independent artist is the ability to decide what I make and how it looks. I have the luxury of only making sculptures that I completely love. I animated for Disney Feature Animation for 20 years, and it was an absolute blast. A grand experience I would never trade—I learned so much about design, expression, confidence, decision-making, all aspects of my creative life that are so important in my life as a stone sculptor. I reflect on the threads that weave through life and it is pretty cool. Carol, how nice to meet you at the Loveland Museum Members’ Preview for the Governor’s Show. Thanks for your enthusiasm for Codename White Mouse, Espadrilles! Ms. Wake’s story is better than any fiction, so glad it inspires you!